As noted previously, these bi-annual rankings provide some of the most popular content we produce each year, in large part due to the amount of effort that goes into gathering and preparing the evaluations. We’re confident nobody outside of those employed by the team spends more time talking to coaches, scouts, and general managers about the organization’s top prospects on a regular basis than MayorsManor. Our final slotting of players is also influenced by hundreds of hours of game action and debating the prospects with a myriad of well-respected hockey people, including our key sources inside the team. Looking at the period between a prospect’s draft day and their NHL debut, no one has seen as much movement up and down these rankings as Forbort. 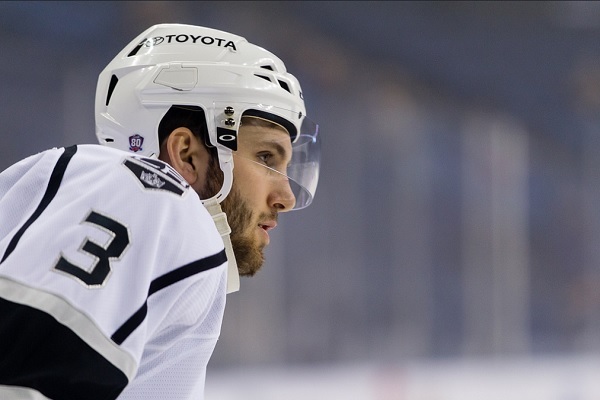 Once thought to be a true top prospect, in part due to the Kings selecting him in the first round of the 2010 NHL Draft, Forbort’s growth plateaued during his college career. However, over the past two seasons, there has been a dramatic improvement. He has positioned himself back near the top after showing that his game can translate to the professional ranks. Further, the North Dakota alum possesses something you simply can’t teach – great size. While not a physically intimidating defender, he still finds a way to use his size to his advantage. Utilizing his great range, Forbort is able to contain opponents and eliminate threats in his own zone. His potential isn’t as high as once thought by some, but Forbort should prove to be a consistent defender who can eat minutes on a third pair, while filling in on a second pair, if needed. Pessimists will see this ranking and express concern for Zykov sliding down to No. 4. Yet, we are nowhere close to giving up on the kid. In fact, there is plenty to be optimistic about; and if not for his health last season, who knows what might have happened. 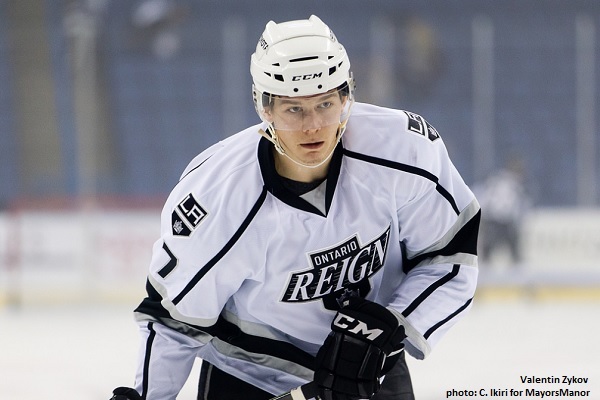 He had a really good camp with the Kings before the 2014-15 season, and management was encouraged by his goal of wanting to go back and dominate the QMJHL. Unfortunately, his time out of the lineup – and a spot on Team Russia at the 2015 World Junior Championship – left us thirsting for more for the second straight season. A power forward by nature, Zykov is crafty and creative with the puck, possessing fine offensive skills. He thrives along the boards and in front of the net. While his progress offensively wasn’t great, he has certainly gotten better without the puck, as his defensive game has taken strides. Coming into this season, we were concerned about the young Russian potentially struggling as he adjusts to life as a pro, but the potential to be a good player is still there. During preseason conditioning testing a few months ago, he scored very well. However, his training approach is still a work-in-progress, even though the Kings staff had him for the whole summer. He is on the right path, though – including spending a lot of time with Jeremy Clark in Minnesota and in Los Angeles. There are many different perceptions of Zykov and he can sometimes be a bit polarizing within the organization. He scored 40 goals in the Quebec league as a rookie, so some people have tried to translate that into 30 goals in the NHL. Obviously, that is still to be determined. Meanwhile, players will tell you he is hard to play against, which isn’t something that is always taught. As one scout put it, “You can compete, you can work hard and you can have energy; but when you’re hard and heavy, it’s just something you’re born with.” As an example, Trevor Lewis works and competes; Dwight King doesn’t really throw his weight around, but he’s still heavy. 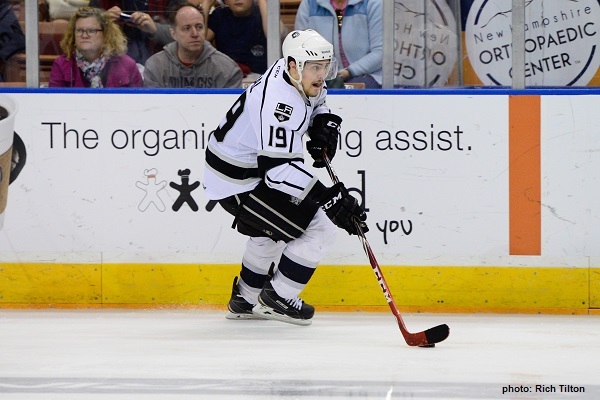 For Zykov to have a good season, he will need to show a balance of offensive and defensive elements with the Ontario Reign this year. He needs to be the most competitive guy out there, always showing a strong north-south game. After a dominant showing in the Monarchs’ Calder Cup run last season, Weal’s credentials are legit. The diminutive center was arguably the best player in the AHL playoffs, controlling the pace of play and generating offense on nearly every shift. Washed away are the doubts about his size, as his showing in the AHL over the past three years confirmed, Weal is more than capable of thriving amongst foes much larger in stature. He possesses elite speed, vision, hands, and IQ. The only thing he needs now is the opportunity to showcase his skills at the NHL level on a consistent basis. In the next article, we’ll wrap up this edition of the rankings, revealing the No. 1 overall prospect in the Kings’ organization. As always, we would also like to pass along many thanks to the plethora of hockey sources who contribute to this series, including our longtime AHL correspondent, Andy Tonge. For your easy reference, we have listed some of our other top prospect articles below. I Love the “Z”! Hope he continues to progress and I need to get to Ontario to see him play in person! I wonder where Kempe and Mersch are going to fit into the rankings?